The same week, Morgan Stanley reported that Trump or no Trump, “we expect the US to exceed the Paris commitment of a 26 to 28 percent reduction in its 2005-level carbon emissions by 2020.” The investment banker cited as the reason its conviction that with a few exceptions, renewable energy would be cheaper than fossil power by 2020 in every important market. But such radical market share growth for non fossil fuel energy is not reflected in most top down projections. DOE, for example, continues to project very slow declines in US climate emissions over the next decade. More alarmingly, an analysis derived from BP’s most recent “Statistical Review of World Energy” looked at the percentage of total world energy derived from fossil fuels and at the rate of growth of such energy use, and concluded that there was no evidence whatsoever of a turning point having been reached. Why such sharp divergences of opinion? Is one side cooking the books? Probably not. There is a well known difference in economics between leading and trailing indicators. After all, this year’s consumption of gasoline, or combustion of coal, is largely driven by investments made in cars or power plants a decade or three ago. But this year’s investments in various kinds of vehicles or power generation will cast an emissions shadow for years to come. Actual consumption (or emissions) is a trailing indicator. 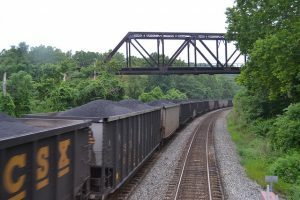 The decision by CSX to no longer to invest in its coal business won’t drive coal demand down next year at all – but over time, if sustained, less coal will come to market – it’s a leading indicator. The problem with leading indicators is that no one is a sure-fire harbinger. Sale of electric vehicles is one leading indicator in the transportation sector. But so is the percentage of US vehicles sales that are SUV’s. Both might go up in a given year. 1. A problem with the majority of energy reporting is it does not provide the reader with a balanced mix of leading and trailing indicators. As policymakers try to make decisions based on current and projected data, what indicators and forecasts should they use to make effective decisions? 2. And, in each of the key sectors that drive our climate, what are some good nominations for the best leading indicators? EIA’s Annual Energy Outlooks are the most influential projections of future energy trends in the United States. While they are explicitly “not predictions of what will happen”, they are often mistaken as such, and thus influence policy and investment decisions. Unfortunately, these Outlooks have for many years overestimated the costs of renewable energy and electric cars. That has led them to vastly underestimate the rates of solar adoption, and overpredict emissions from the power sector. It remains to be seen whether their electric car projections will prove to be overly pessimistic as well. A needed improvement would be for EIA to offer alternate scenarios showing more rapid reductions in costs of clean energy and alternative fueled vehicles. While EIA offers such scenarios for cases such as oil prices, such analysis has been lacking for other non-fossil energy sources. My nomination for the best leading indicator is CO2 (and CO2e) concentration in the atmosphere. It is a direct reading of fossil fuel emissions, land use changes, and the Earth’s response to warming. It’s the only indicator that really matters when it comes to climate change. For example, if we cut fossil fuel emissions in half and the Earth’s emissions (say, from permafrost) exceeds the amount we cut, we are still on an unsustainable path. And CO2 is a leading indicator. The last time CO2 was its current value (405 ppm), sea levels were about 75 feet higher than today. Out-of-date assumptions about fossil fuels also impact IPCC scenarios. The current episode of the Energy Transition Show podcast discusses how RCP 8.5 is based on decades old incorrect assumptions about coal. Dan’s comment flags an important point: you need to specify what outcome you are projecting. Dan is correct, if you want a leading indicator for climate forcing — what happens to the atmosphere — concentrations of greenhouse gasses are the best leading indicator. But if you are looking for a sense of what is likely to happen with emissions — which is what we could control and manage for — concentrations are a trailing indicator. I should have noted that in my posting. But the question is what are we managing to? I assume we are managing to prevent unacceptable climate outcomes. Climate scientists tell us that CO2 concentrations are already too high and are on a path to unacceptable consequences (+4C), so in addition to managing emissions (to zero by 2050), it seems that we will also need to manage CO2 concentrations in the atmosphere (by implementing Direct Air Capture of CO2). On a global basis there is no convincing evidence that coal will not remain a leading source of energy for decades. The construction of coal fired plants in Asia is a leading indicator. In the US, the best indicators are price and subsidies. In a market that is not tilted by subsidies, oil and natural gas use will only decline when they become more expensive than alternatives. The best test for the viability of alternatives–wind, solar, and EVs–is to eliminate generous subsidies and let them compete on a level playing field. Before anyone responds citing fossil subsidies, deductions that are available to all are not subsidies. Just set a level playing field and let technology and the market determine the winners. Prices and subsidies are indeed two potential leading indicators — and are frequently used in the electricity sector in particular, because electricity prices are significantly regulated and hence only moderately volatile, and because there is head to head, real time competition between different fuels. But if you look at transportation, you find extraordinarily volatile oil prices, a lack of head to head competition and fuel consumption driven by vehicle choices made over over a decade or more — so that few of today’s cars were bought with today’s oil prices in mind — because even oil traders can’t predict them with any accuracy. So for vehicles, I think the best leading indicator is the mix of vehicles being bought today and their average fuel consumption — but it’s not very good, because if oil prices spike next year, that mix will change quite quickly. And, Norway is going to reduce its subsidies because they have been too generous, stimulating demand beyond expectations. It is a well established economic principle that if you want more of something, lower its price and if you want less, raise its price. Putting aside the fact that fossil fuels are more heavily directly subsidized than renewables and that renewables are cheaper or becoming cheaper in places where there are no subsidies, fossil fuels emit greenhouse gases that are causing and will cause enormous damage and costs to society. So the total costs of fossil fuels (direct and external costs) are far higher than for renewables. You can’t put aside what is not correct. You can start with EIA to see that renewables are more heavily subsidized that fossil fuels. And, there have been numerous analyses that have corrected the mischaracterization of deductions for subsidies. The weight of evidence clearly does not support your assertion. You make an assumption about the effects of fossil fuels and global warming. Without getting into scientific details, your assumption is based on high climate sensitivity. But, the IPCC uses a range that varies by a factor of three. It also does not support your assertions about damages which I assume you mean extreme weather events. I think Dan, Bill and I can agree that it is prices as they emerge taking into account both subsidies and anti-competitive behavior that are the best indicators of future consumption — consumers don’t refuse to buy something that is cheap just because it is subsidized, nor do they keep buying something that is expensive because of monopolistic behavior. So while subsidies are a vital policy issue, they are also a determinant of future demand. But the argument that renewables are more heavily subsidized than fossil fuel relies on staggeringly incomplete accounting. Not only, as Dan points out, does it assume that there is no social cost to climate risk, there are clearly enormous social costs to air pollution from coal combustion in power plants, water pollution from coal mining and ash disposal, nitrogen oxides and particles from diesel and gasoline powered transportation. These are important subsidies not capture din EIA’s calculus. And there are also past direct economic subsidies which have become embedded in energy markets creating incumbent lock-in. Energy markets are simply so heavily and complexly subsidized and distorted that arguing that some fuel is priced on the basis of pure market forces is simply baloney. Government policy created heavily polluting energy technologies; it’s not inappropriate for them to drive us towards safer and cleaner fuels. I agree completely that it is not inappropriate for policy to drive us toward safer, cleaner fuels, and I agree completely with the idea that we must increase renewables in our energy mix. A society can and should choose the future it wants. However, actually getting to that future is another matter. As we go down the renewable/sustainable energy path, we need to identify and overcome real obstacles–not ignore them. We have already run smack into one such obstacle: generating more electricity from wind and solar actually increases the electricity prices paid by consumers. When proponents of solar/wind electricity talk about their low cost, they are referring to the marginal cost to generate this renewable electricity, not the actual or system level costs. Unfortunately, most proponents of renewable electricity don’t account for the very real system level costs to integrate renewables into the grid. And it is the system level costs that the consumers (voters) pay, and governments (at least elected governments) eventually must react to. This is not empty academic theorizing. Here are the data. Read the Economist article on this subject to understand why this is happening and some possible remedies. We are NOT going to get a lot more solar and wind in our energy mix until this problem is solved. We do need solar and wind. And so we also need to focus on solving the problem. We have to deal with reality. 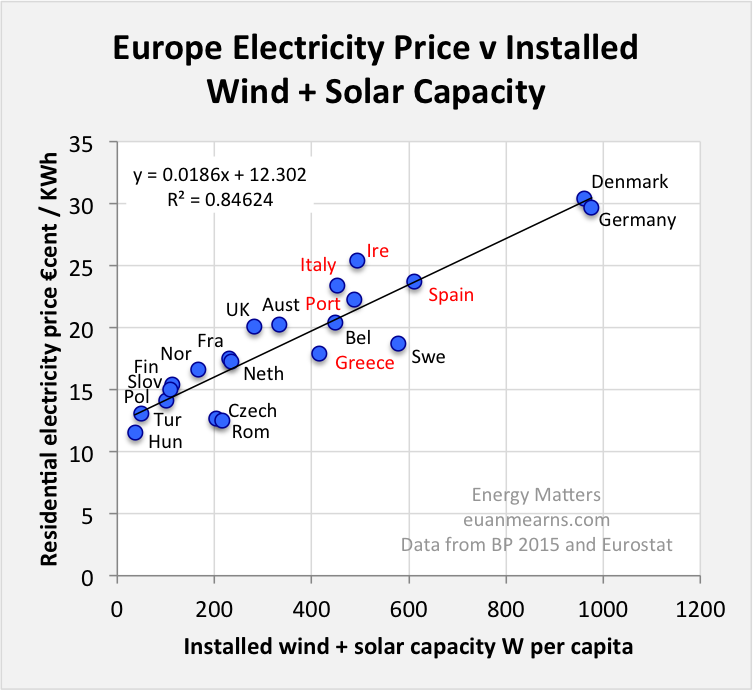 And the reality is that solar and wind electricity are increasing the system level costs and therefore the prices paid by individuals and businesses for electricity. Carl, I am glad to find something that we agree on–the role of prices. Subsidies are the devil’s elixir. They distort and are tools of industrial policy which has a poor track record. For the record, I oppose all. The social costs that you refer to get internalized through regulation. EIA doesn’t address them because they do not meet the definition of subsidy which involves the expenditure of tax dollars for favored policies. Your claim about subsidies being deeply embedded in energy markets must be one of your creation. It certainly doesn’t reflect the economic literature or in my view energy reality. You are simply wrong in asserting that government policy created the internal combustion engine and the gasoline market. They were the product of technology and economic forces and you are the beneficiary of the economy that mobility enhanced. The auto and auto industries would be amazed to learn that the externalities created by them have not been addressed by regulations. If you just look at the data on air pollution, it is absolutely clear that the contribution from light duty vehicles has been declining. Bruce: While large-scale deployment of renewables does put price pressure on traditional power generation sources, that’s not necessarily a bad thing. Already, the health costs of coal (not including the climate change costs) exceeds the value of the electricity produced in some places. In other words, coal power has negative social value. When you throw in the costs of climate impacts, there is no contest. And these “external costs” are real and must be paid through higher taxes to pay for extreme weather events, droughts, and floods, higher health costs, higher food prices, higher insurance costs, higher uninsured losses, and so on. We’ll figure out how to integrate high levels of renewables into the grid. Other countries already have. There may be some impacts on electricity prices, but it is a small price to pay (is that a pun?) to avoid devastating costs imposed by further climate change. Bill: My “assumption” about fossil fuels emissions causing global warming is supported by every major scientific academy in the world! There is only a small chance that climate sensitivity is <2C, the consensus value is 3C and recent studies show that climate sensitivity may be higher in a warming world than it was is a cooler (Ice Age) world. In any case, how can you suggest that policy be set on the hope that it will be low? That would be like saying there is a 20% that this plane won't crash so I'm going to put my child on the flight! Dan, I am not denying that CO2 is a greenhouse gas that contributes to warming. My view of the empirical evidence, without biased adjustments, is that it is less than you believe it is. And, the warming effect is not linear. As a nation, we already have in place policies that have lead to reductions and the shift from coal to gas leads to further reductions. As for sensitivity, the IPCC has reduced the lower bound but not increased the upper one. Until we better understand natural variability and other factors that contribute to warming, I believe that caution in approach is preferable to certitude. While temperatures ought to be warmer than they were during the Little Ice Age, they are not warmer than they were during the Medieval Optimum. I will say that I am pleased that we can disagree civilly. 1. We know that you do not think that global warming is as serious as climate scientists say. I believe the climate scientists. 2. Why do you keep saying that the [CO2] warming effect is not linear? No climate scientist claims its linear. It isn’t linear. So what? 3. Yes, we have policies that are leading to some reductions in fossil fuel usage. But it is nowhere fast enough. 2016 was 1.2C warmer than preindustrial and 2017 is on track to be the second warmest year ever… and there is no El Nino! 4. Again, implying that climate sensitivity may be low means nothing for setting climate policy. The chances that it is low enough to be helpful are very small. And we have already warmed 1.2C and we haven’t doubled CO2 yet! And more warming is in the pipeline even if we cease emissions tomorrow. Again, why would you put your child on a plane with an 80%+ chance of crashing? 5. We cannot wait to “better understand natural variability and other factors.” When the stakes are so high, uncertainty is a cause for action, not inaction. Dan, we have probably taken this exchange beyond the point of it being informative. You make assertions about what I believe without knowing what I really believe in terms of policies. I don’t challenge scientists on CO2 warming the earth. I don’t know what all scientists believe about human attribution as the surveys that have been done have been shown to be biased. The reason non-linearity is important is that incremental warming is decreasing and depending on where we are on the curve–no one knows–it could be insignificant. Your claims about how recent temperatures must be based on surface measurements which have been doctored. The satellite measurements which I believe continues to show an almost 20 year hiatus in warming. I believe that our understanding of the climate system and how it operates is meager. Ed Lorenz believed that since it is a chaotic system it may be beyond being predicted. I am deeply skeptical about climate models. Without some fundamental agreements, we are never going to reach common ground. Bill: Your comments that climate scientists are “biased”, have “doctored” temperature data, and don’t know where we are on the “nonlinear” CO2 warming curve are wrong and dangerous. Even if there was as much uncertainty as you imply (there isn’t), it still would not support your contention that we should hold off on implementing climate policy and take more time looking into the science of climate change. That approach will likely result in disaster. As you know, satellites do not measure surface temperatures. Thermometers do. There is not a grand conspiracy to doctor temperature data, though improvements in interpreting data happens continuously. The Berkeley Earth (dot org) project — funded by the Koch brothers! — started off thinking like you but they came to agree with the world’s temperature measuring groups in the US, Japan, and Europe when they did their own analysis of the data. And all the groups show that 2016 was the warmest year ever and there was no pause in warming in the past 20 years. It’s one thing to try to confuse people when a single El Nino year was particularly warm a couple of decades ago, but now that the past 3 years were all record warm years, that tired meme is over. And of course, climate scientists know where we are on the nonlinear warming curve. That is what the climate sensitivity value is! Yes, once we double to 560 ppm, it will take another doubling to 1120 ppm to get the same shot of warming (though there are longer-term feedbacks that may be nonlinear in the other direction (amplifying)). One doubling will certainly be bad enough. Dan, if you had not purposely distorted my reply to you I wouldn’t bother sending this. I did not say that climate scientists were biased. I did say that surface measurements had been doctored and that fact is well documented. The fact that you assert that scientists know where we are on the CO2 curve is ridiculous since if they did there would not be a range for climate sensitivity. Your comments tell me that you are not open to honest discussion. This is the end as far as I am concerned. Morgan Stanley reported that Trump or no Trump, “we expect the US to exceed the Paris commitment of a 26 to 28 percent reduction in its 2005-level carbon emissions by 2020.” This is key. The road for policy makers is clear. Work together and learn from each other’s successes in reducing costs and displaying leadership. DC with their Smart Roof Program and San Francisco with Zero Waste. Both provide a road map as do other cities. C40 Cities Climate Leadership Group is one place I turn. To take from their website, C40 is a network of the world’s megacities committed to addressing climate change. Acting both locally and collaboratively, C40 cities are having a meaningful global impact in reducing both greenhouse gas emissions and climate risks. C40 brings together a unique set of assets and creates a shared sense of purpose. C40 offers cities an effective forum where they can collaborate, share knowledge and drive meaningful, measurable and sustainable action on climate change. Explore an interactive list of the C40 cities. The leading indicators are economic. I would argue that private investment in energy infrastructure should be a strong leading indicator. I’ve been arguing since the election campaign that the rhetoric from a given president about the future of coal is irrelevant, given that an investor building a coal power plant is making a 40-year bet (not a 4-year one). Private investments in energy efficiency, storage, and renewables indicate the expectations of the market regarding their future; energy investments in fossil power plants, and transmission/distribution of fossil fuels indicates the market’s expectations on their future. And those expectations encompass supply, demand, and policy. I think this is probably my favorite and most easily measured leading indicator. Even motor vehicles are 12 year bets, electrical generating facilities are 40 year bets, and roads vs. rail in the goods shipping sector are even longer range. BNEF does measure investment in renewables vs. other electrical generating technology, and projects them. In other sectors of the economy while the data is available, I’m not aware of long term tracking indexes that are easily available. That seems like a real lack. I recently completed a review of New York State’s REV program which puts great emphasis on expanding the use of renewable energy, especially in the production of electricity, and in reducing the amount of GHG released in NY. Several conclusions that were reached have a bearing on the use of indicators, both leading and trailing. While much of the planned renewable energy expansion in NY is centered around building 1600 on-shore wind turbines and 415 huge off-shore wind turbines at a combined cost that I estimate to be about $30 billion dollars, this mammoth activity would hardly move the needle. If completed, this investment would only reduce NY GHG releases by about 5%. This is because electricity generation in NY is a relatively small contributor to the State’s GHG releases, about 14%. Even then, all these wind turbines plus a fourteen fold increase in PV electricity would only decrease GHG releases from electricity generation by 28%. Most of the sources of GHG releases in NY come from transportation and the residential and commercial sectors, i.e., from fossil fuel burning in cars, space heaters, hot water heaters, cooking, and some from gas supplied clothes driers. The magnitude of replacing tens of millions of fossil fuel burning end use devices dwarfs the challenge of getting enough clean energy electricity. Moreover, it is electricity that in large part will replace the fossil fuels burned in this huge multitude of end use devices. So we will need many more sources of electricity. A low carbon future is largely an electrified future, but who is estimating how much electricity will be needed and how much it will cost? Until one has a more comprehensive view of what has to be done to achieve a low carbon future, can one truly identify which parameters should be used as leading or trailing indicators? The best leading indicator of fossil fuel consumption is probably the capital investment in finding, producing and consuming these fuels. Energy is a capital intensive business. Since we cannot consume a fuel that has not been found and produced and since it takes decades to bring new fossil energy to market, I cannot think of a better leading indicator than total investment in finding, producing and bringing fossil energy to market. The IEA provides some useful statistics here, but Bloomberg is often better. As far as oil and gas are concerned, proponents of renewable energy ought to be both encouraged and worried because of recent trends in upstream oil and gas exploration and finds. The bottom line is that discoveries of new oil and gas have trended down in recent years, and most recently, the bottom has dropped out of capital investment in finding more oil and gas. If the people who know the most about finding and producing new oil and gas are not investing in their own business, that seems to me to be a pretty good leading indicator. There already are far more known reserves of fossil fuels than we can possibly burn. Any new discoveries will just be identifying stranded assets. Instead of looking for fossil fuels that can’t be burned, fossil fuel companies should be taking the $600B exploration budget and paying it out as dividends. The ideal leading indicators of fossil fuel use in the electric power and transportation sectors would be detailed strategic plans established in each of these sectors by the federal/state governments working together with industry to replace coal use for electric power and oil use in transportation for the entire country. There should be a detailed strategic plan of how to most cost-effectively replace all the coal-fired power plants in the U.S. with renewable (wind, solar, hydro, geothermal) power supplemented with storage technologies and natural gas as necessary to deal with the intermittent nature of wind/solar power supply. There should be a detailed strategic plan of how to best replace all gasoline/diesel powered vehicles over time with electric, natural gas, and hybrid electric vehicles. This transportation sector strategic plan would encompass the automotive industry transition to produce the new generation of vehicles on a large scale cost-effectively, and the transition of the existing oil company service station infrastructure to multi-fuel service stations with charging stations for electric vehicles and dispensing of alternative fuels such as natural gas. Joint government/industry strategic plans are needed to plan these massive transitions away from fossil fuels in a relatively short time frame to properly address the global warming problem. The strategic plans would ensure government and industry are committed to replacing coal use for electric power and oil use in transportation and clarify the steps and time frame to implement the required infrastructure and policies. If this were done, the industry and government would have very clear indicators on how rapidly fossil fuel use would decline over time. As a postscript to Carl’s thread, it would seem that the decision by the Norwegian $1 TRILLION sovereign wealth fund, which was built on oil revenue, to drop investments in oil and gas might suggest that we have moved past just leading indicators into a more widespread acceptance that markets have started fundamentally re-pricing risk related to carbon asset value.